GRAND BASE FUKUOKA is a smoke-free property. Located in Chuo-ku, this apartment building is within a 10-minute walk of Canal City Hakata and Tenjin Underground City. Tenjin Core and Fukuoka Anpanman Children's Museum are also within 1 mi (2 km). Watanabe-dori Station is 6 minutes by foot and Tenjin-minami Station is 7 minutes. This smoke-free apartment building features free WiFi in public areas. Each apartment features a kitchenette, free WiFi, and a separate tub and shower. 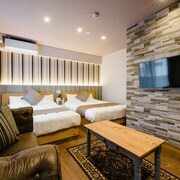 GRAND BASE FUKUOKA offers 15 accommodations. Accommodations at this 3-star apartment have kitchenettes. Bathrooms include separate bathtubs and showers. This Fukuoka apartment provides complimentary wireless Internet access.